Having read our article on Clipstone Lodge (aka Archway House), Jane Leslie contacted OurNottinghamshire about the time when the building was used as a school in the mid 19th century. 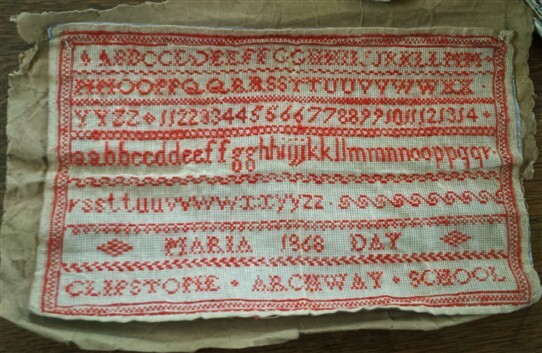 She writes: "I have just found an old sampler embroidered by my great-grandmother, Maria Day, about 1868 and at the bottom she has embroidered "Clipstone Archway School". "I know that she was from Edwinstowe and that her father, James Day, was a schoolmaster and Methodist Minister who died young leaving two children, Maria and Harry. His wife Eleanor (nee Butler) made a living by dressmaking and hat trimming. She moved to Matlock when she was sixteen and married George Hodgkinson.